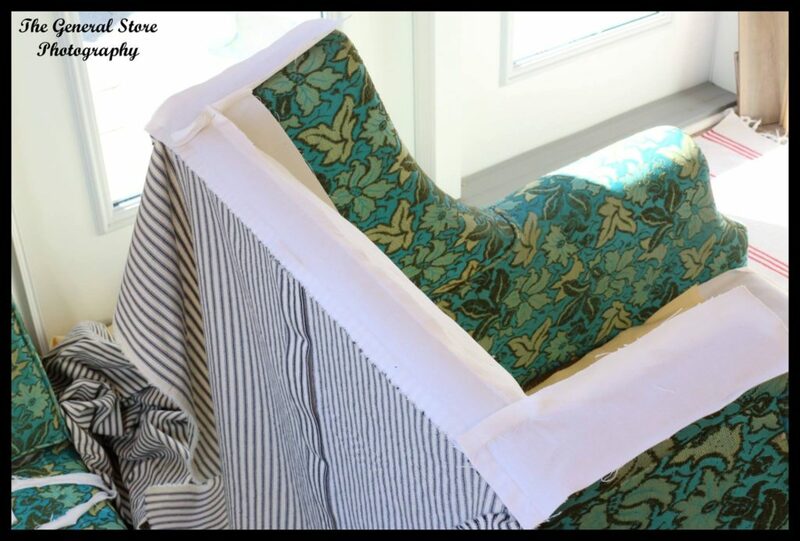 Before I started cutting fabric, I checked out blogger Miss Mustard Seed’s tutorial on how to sew a slipcover. 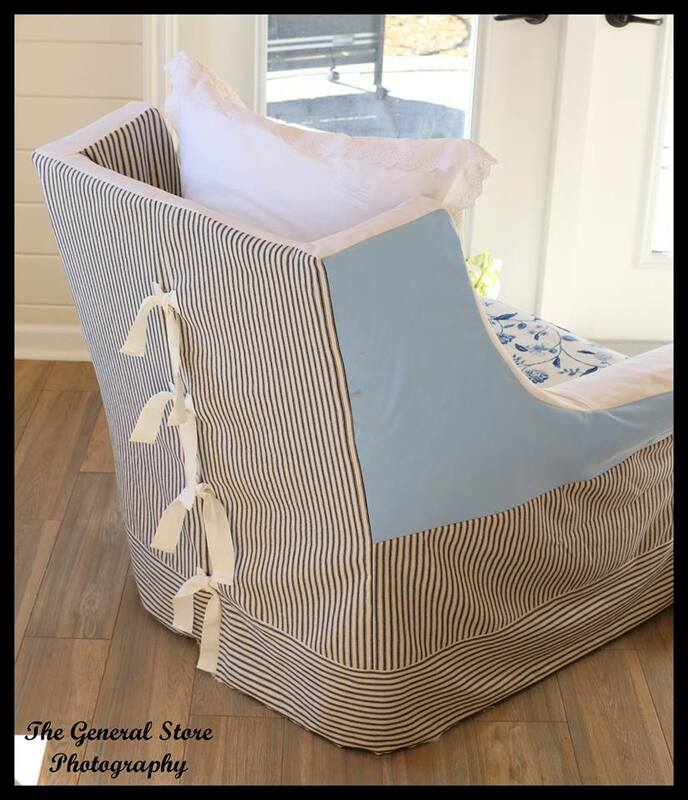 One of the first things she said was not to use stripes if you are inexperienced. Oops! 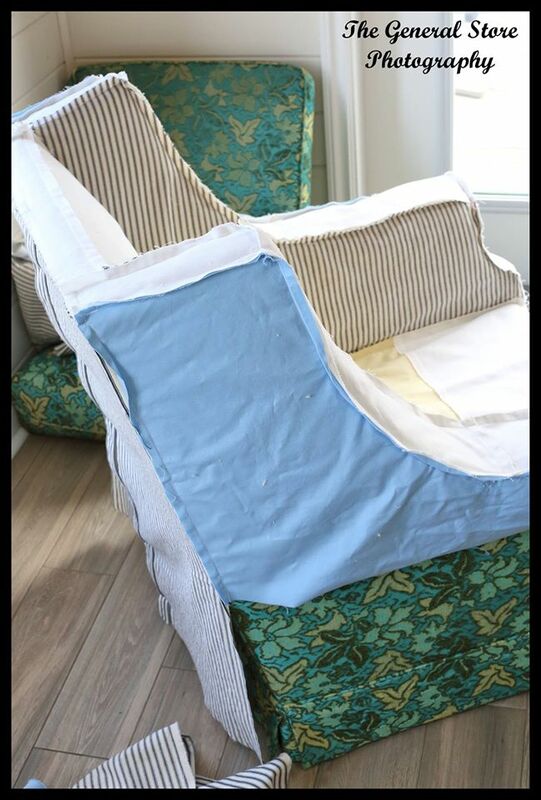 Her method of putting a slipcover together is to pin-fit it. 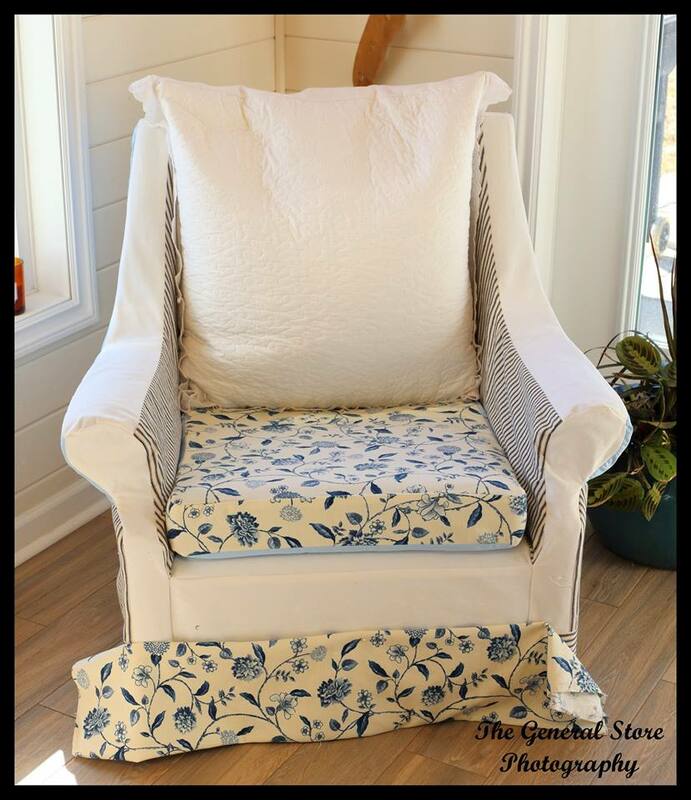 Pin a couple of pieces of fabric together on the chair and then trim to about a ½” of your pins. 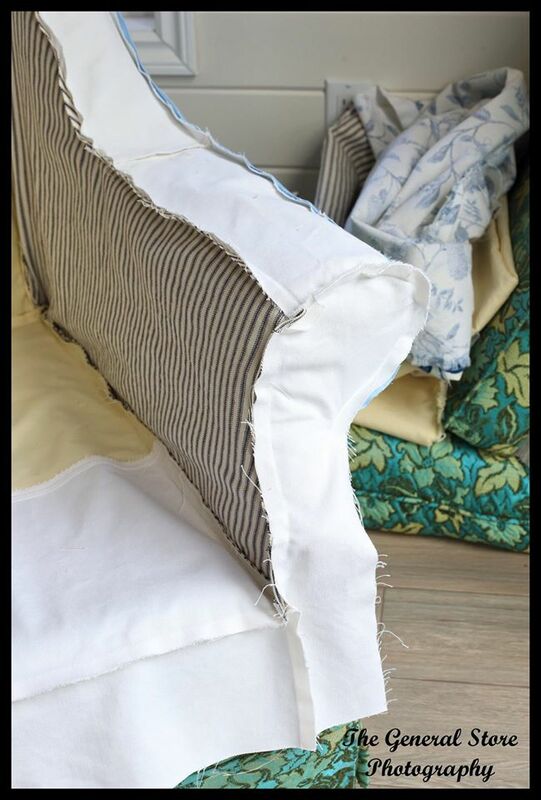 Take the fabric off and sew the seam. It actually works really well except for where I needed to be more accurate because of the stripes on my fabric. 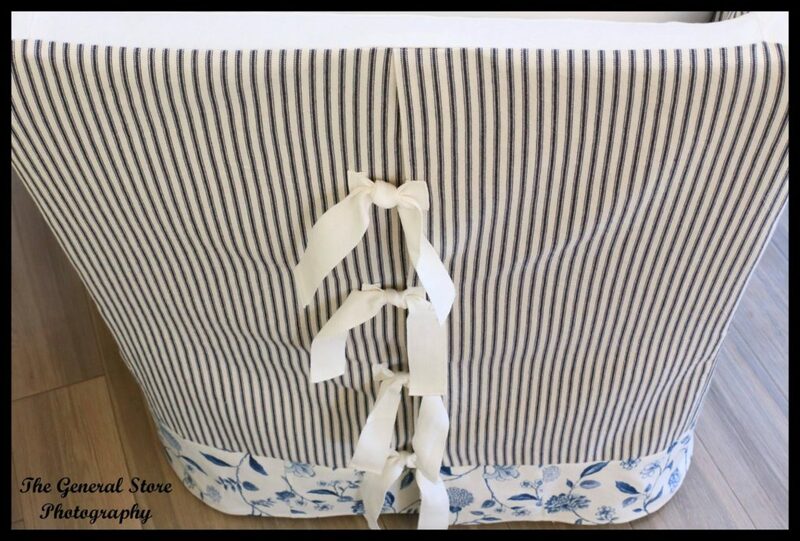 I started with the back which I made in two pieces that would have buttons or ties to allow the slipcover to be removed from the chair for washing. Then I moved onto the fabric along the top of the chair. I worked my way down the arms and then the inside of the chair. I used some yellow denim where it wouldn’t be seen when the cushions were on. At this point, I paused for a day or two to figure out how to do the sides. 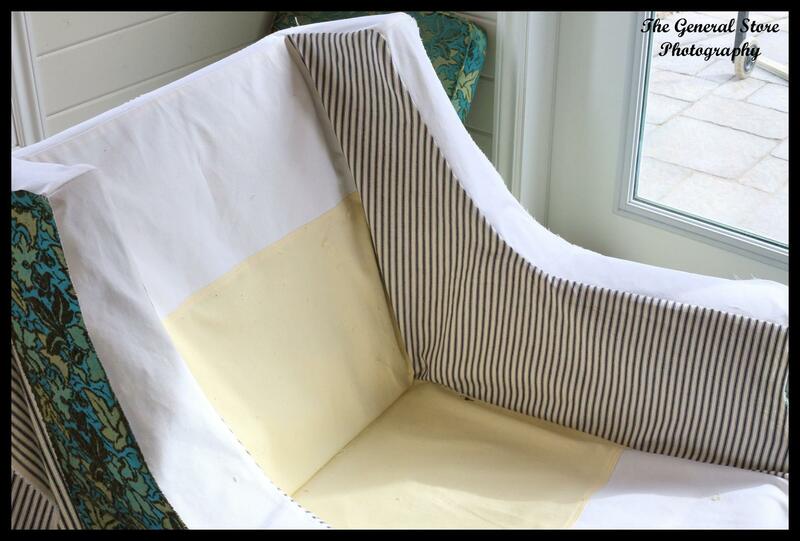 The original plan was to use the striped fabric but because of the contours of the chair, I knew the stripes would end up wonky. So I pulled out some blue fabric that I had for another project and cut it up for the top half of the sides. 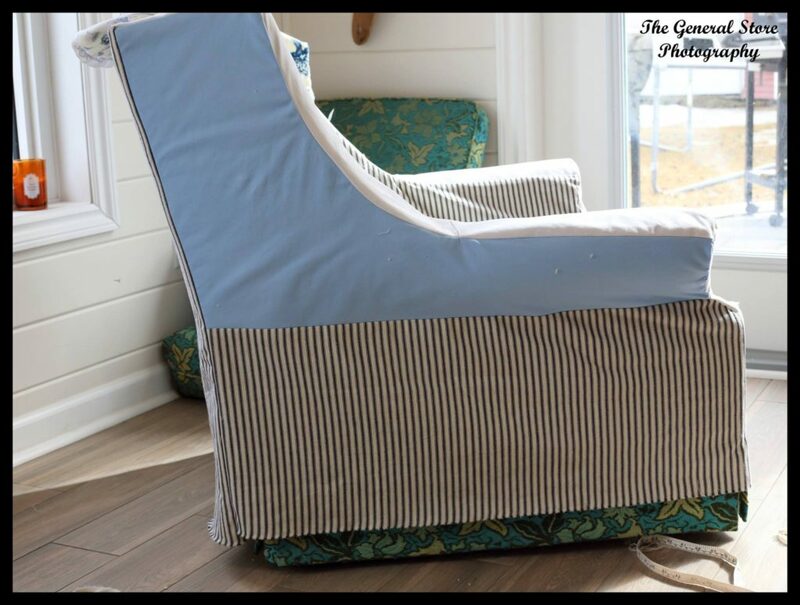 The lower half of the side was a flat rectangle so the striped fabric was fine there. At this point I attached ties to the back so that I could see how the slipcover would hang before I attached a skirt. 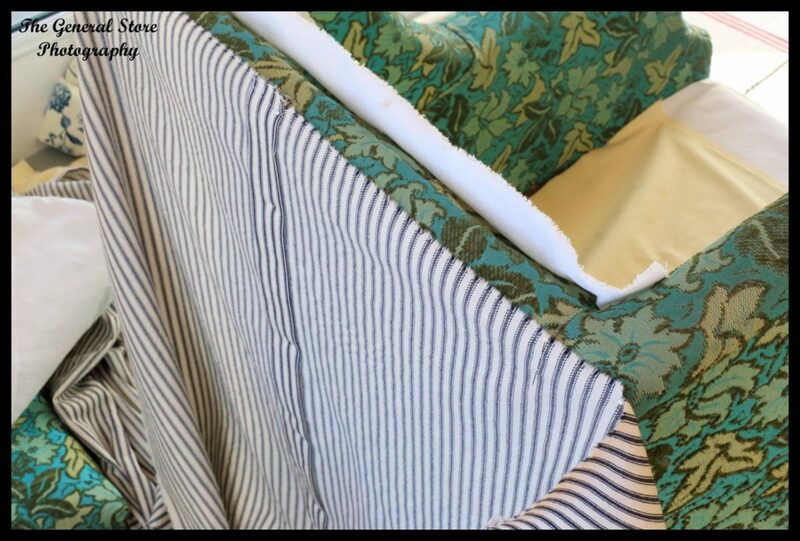 Then I cut the striped fabric along the selvage edge and sewed it in place. And… I didn’t care for the end result. Hmmm. I put together the cover for the seat cushion using the floral fabric on the top and the blue around the rest of it. Looking back I would have used the floral a little more generously so that the blue wasn’t peeking out on the bottom edge. The rest of the floral was going to be used on the back cushion and then had a brain wave! I had a large white pillow that we no longer used and it worked perfectly! So I pinned the floral along the bottom edge to see how it looked. Much better! The striped fabric came off and the floral was sewn in place. And this is the result! I have to say that I really love it. I learned a lot! It has a nice cottage feel. 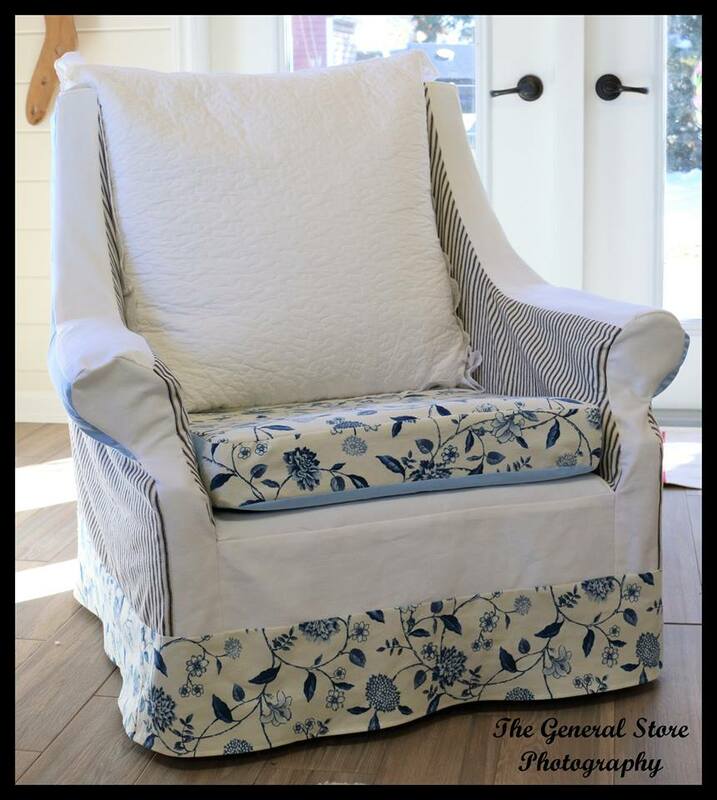 I used fabric purchased for the chair but also bits and pieces from other projects. The ties on the back came from twill ribbon that was tied around a throw that I had purchased a few months ago. All in all I am satisfied and would try this again if I had the opportunity to do so.